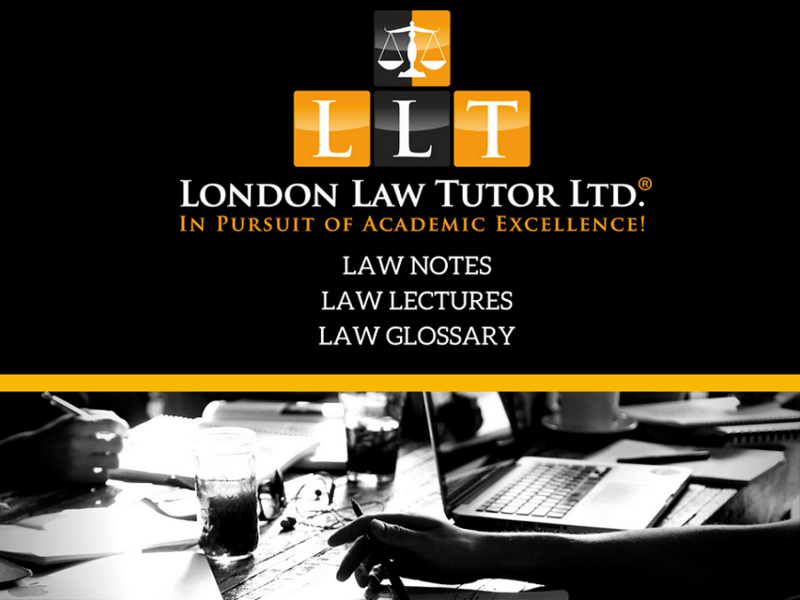 Law Essay Help | Buy Law Notes | Law Dissertation Tutors | London Law Tutor Ltd. The team at Our Law Library and Law Blog provide students with law essay writing, editing and proofreading tips, law notes and free audio lectures. Our Law Blog provides articles on recent developments in diverse areas of law. We have also provided guidance on law exam technique and much more. Kindly find below a sample Case Table that is very effective and which can be created easily using MS WORD. This can really help you stay organised and memorise the plethora of cases especially for case intensive subjects like Tort law, Contract law or EU law. We highly recommend using this technique as an aid to exam preparation in additon to other study tips and exam revision techniques listed below. The primary aim whilst undertaking a law degree is to acquire the skills and knowledge necessary to become a great law practitioner. The secondary aim is to apply those skills by passing you exams. It should be borne in mind that although passing your exams is obviously important, you should always apply yourself towards becoming a good lawyer by avoiding the trap of focusing all your attention on just the assessments. Our aim is to provide you with free advice on how to revise for exams effectively. We shall discuss stages of revision and provide tips on exam technique since that is an area where many law students tend to struggle. Law students who become great lawyers attend lectures regularly, they always prepare for seminars so they can participate in legal discussions and they also volunteer for law moots and debating competitions during law school. In order to be successful one should always attempt to give their studies the time and effort they require. Last but not the least, becoming a good lawyer is the strongest foundation for exam success and in our latter discussions we shall try to build upon that foundation. Develop clarity of thought by attempting past exam papers. Do further reading than the prescribed textbooks and cite your research. Stay disciplined by keeping well defined and reasonable goals. Contrary to what many students believe, revision preparation starts at the beginning of the academic year. Attendance at lectures and full preparation for, and participation in, seminars provides an invaluable foundation for revision for three reasons. First, it provides you with a more complete set of notes from which to revise. Second, memorisation of material is quicker and easier if you have studied it before. Third, the lecturer may provide hints and tips on exam content and technique. Has the lecturer or seminar tutor provided any hints as to which topics will be examinable? It should be borne in mind that one can only obtain these clues by attending lectures and seminars. The number of lectures/seminars devoted to a topic can give you a clue as to the importance of a topic, and hence its likelihood of appearing in the exam. Most legal subjects have a topic that is always examined (e.g one cannot imagine an exam on the Law of Tort without a question on the Tort of Negligence). When studying law it is imperative to remember that legal topics do not exist in isolation from each other, and exam questions (especially problem questions) may cover numerous topics. Broad revision coverage will help ensure you are in a position to answer questions on multiple topics. The number of topics you revise should be greater than the number of questions you are required to answer. Revising three or four topics for an exam that requires you to answer four questions is very risky. This is due to the fact that even if your chosen topics come up, the exam question might be particularly difficult. Therefore, the practice of question spotting should be avoided at all costs. Determine an appropriate start date for the timetable, which gives you plenty of time to cover the relevant material. This will depend strongly on how many exams you have to sit. Determine an appropriate end date for the timetable. A good choice would be a day or two before the first exam. Do not factor in gap days between exams for revision, as this will cause you to focus too much on your first exam. Divide your days into revision sessions (e.g. half-day sessions, or morning, afternoon and evening sessions). Either allocate consecutive sessions to a single subject, or alternate sessions between subjects. The former allows prolonged concentration on a subject, but you may forget some information as you near the end of the timetable. The latter is less focused, but more varied, so there is less risk of boredom setting in. Take into account any other commitments you might have (e.g. remaining lectures/seminars, coursework submission, employment etc). Ensure that you factor in rest days. Taking breaks from revision is as important as revision itself. An effective revision timetable will not help if you are exhausted before the exam. Remember that different subjects may need more/less revision time. You may want to allocate more revision time to subjects that (i) you find difficult, (ii) are assessed 100% by exam, or (iii) contribute a greater number of credits to your overall degree. However, do not neglect subjects simply because they do not meet any of these criteria. Some topics can only be assessed effectively by essay. Other topics lend themselves particularly well to assessment by problem question. The majority of topics, however, are suitable for both types of question. When you revise a topic, you will not normally know whether it will show up as an essay question or as a problem question. Accordingly, your revision will need to cater for both possibilities. Learning the law itself will serve you well the case of problem questions, but knowing the law alone is not enough to score high marks in an essay. Critical evaluation of the law is essential to gaining distinctions in essays but is not normally a major feature of a problem question although it can be relevant here as well. It should be borne in mind that a good set of revision notes will provide a firm foundation for your studies. Lecture/seminar notes will provide the basis for your revision notes. Once your lecture/seminar notes are complete, you should begin condensing that information down into a series of memorable points. Additional research, for example further case law, academic commentaries should also be incorporated. By condensing your notes, you will make revision more manageable and the act of condensing the notes will begin the process of committing the informartion to memory. If your lecture/seminar attendance has been patchy, it is likely that your notes will contain some significant gaps. You will have to fill in those gaps, which will eat into you revision time and increase your workload. This is why it is so important to take useful lecture notes and fully prepare for seminars. A passive learnign technique, such as reading through revision notes, can aid with your revision, but such passive techniques can quickly become boring, at which point their effectiveness, and your motivation to continue, greatly diminishes. Put simply, passive learning techniques, whilst easy, are not particularly effective at improving understanding and the recollection of information. It is widely acknowledged that utilising active learning techniques is a much more stimulating and effective method of revising. Active revision requires more intitial thought and effort than passive revision, but the rewards are worth it. Active revision requires you to use the relevant information in a more creative and effective manner by devising strategies to aid understanding and recall. There are numerous active learning techniques (e.g. creating flashcards, audio notes, quizzes etc. ), but two of particular note are mnemonics and the use of visual representations, such as diagrams, tables and flow charts. A mnemonic is simply a revision technique that uses patterns, associations and phrases in order to aid memory. For example, you can use the following mnemonic in order to remember the requirements of a valid contract. Past exam papers can usually be obtained online or through your university library. Answering past exam questions is an excellent, but much underused, active revision technique, especially if you do so under mock exam conditions. It allows you to test your knowledge in exam conditions and highlight any areas of weakness where further revision might be needed. It allows you to improve those skills necessary to attain high marks in exams (e.g answering essay/problem questions, writing legibly, identifying legal issues, structuring answers quickly). It also allows you to identify any weaknesses in your exam technique, especially if a lecturer is willing to mark the answer and provide feedback. Some law students may question the benefits of answering past paper questions, arguing that unless the same question were to come up in an exam, the exercise would be a waste of time. This is missing the point. Answering past exam questions is not primarily about learning the law (although this is a benefit) - it is about improving those skills that can be used to answer any exam question. Judicious use of past exam questions can, with the appropriate revision, arm you with the skills you need to undertake any question that the exam throws at you. Confirm the time, location and date of the exam. Get a good night's sleep before the exam. No matter how effective your revision may be, your performance will be adversely affected if you go into the exam exhausted. Ensure that you have an adequate supply of pens, pencils, highlighters etc. Take your student card and and another form of ID (e.g. driving licence) as a backup. Avoid pre-exam conversations, especially with students who appear stressed. Such conversations can have a negative impact on your own preparation. Find out in advance what materials, if any, you can take into the exam with you. Usually law students can take a statute book into an exam with them (with some universities specifying which statute books are permissible), or photocopies of relevant statutes. Find out to what extent, if any, you can annotate exam materials (e.g. highlighting provisions, using page tabs to locate key provisions more quickly). Statute books are useful because they minimize the amount of statutory material that you need to memorise. However, students tend to misuse them by quoting large sections and entire statutory provisions. You should only quote statute where it enhances your essay to do so, and never quote lengthy sections in their entirety. Copying text from a statute book is not a skill that impresses examiners. Before writing anything, take a few minutes to read the entire exam paper and note which questions you feel you can best answer. Once you have decided which questions to answer, read those questions again and make sure that you understand what the question requires of you. Once you are satisfied with your choice of questions, the next step is to plan the answers to those questions. By definition, reading problem questions will take longer than reading essay questions. To save time, when reading a problem question, highlight any material facts and, (if permitted) write in the margin any key cases or statutory provisions that you think might be relevant. It is also worth clarifying the identities of possible claimants, defendants, and relevant third parties.